According to Doshi Audio, "Based on our legendary Monoblock Amplifier chassis, the Doshi Stereo Amplifier ($18,995) shares the same microprocessor control, custom-made Toroid power transformer and Doshi Design Philosophy. 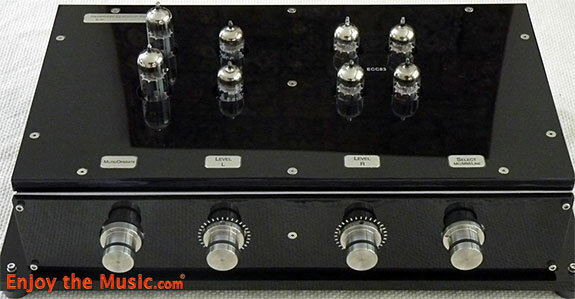 Our first Hybrid design, the Stereo Amplifier needs only two gain stages to deliver 65 Watts per channel into 4 Ohms. Other impedances available on request." Using a J-Fet input and EL34/6CA7 output, this extremely low feedback design operates in Pure Class A up to 50 Watts per channel. Although a single pair output tubes could deliver the power we require, the company felt that by using two pairs per channel it provides a lower output impedance, thus enabling superior control over a wider range of loudspeakers. Employing differential topology from input through output, the Doshi Headphone Amplifier ($3795) solves two issues with headphone drive. Headphones come in a range of impedances and most headphone amplifiers � limited either by voltage or current � are incapable of driving all varieties to their highest potential. In addition, "Balanced Drive" is being used by a growing number high-end headphone manufacturers Doshi Audio's solution implements custom-made Sowter output transformers coupled with high voltage drive circuitry to provide maximum power into three impedance load ranges. Additionally, using output transformers means that both balanced and standard headphone connections can be accomplished without any loss of power output or sound quality. 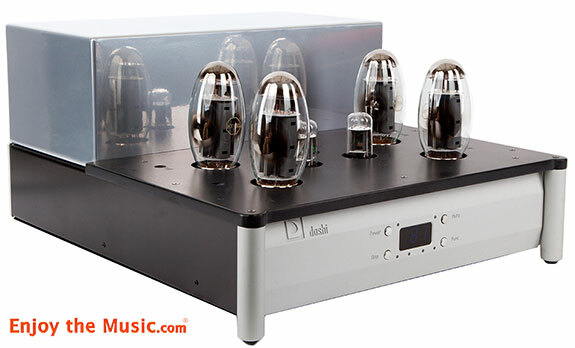 Doshi Audio's design utilizes a discrete differential volume control executed with the same relays found within their Line Preamplifier and an amplifier topology incorporating three separate regulator sections per channel and direct coupling from input to output. The Doshi Stereo Amplifier and Headphone Amplifier, as well as other Doshi Audio products, will be on active demo in The Imagination Suite, hosted by Paragon Sight and Sound. Our Tape Head Preamplifier can be found in both the Nagra (1640 / 1642) and Joseph Audio (1521) suites. Introductory pricing for the Stereo and Headphone Amplifiers is available for orders placed at AXPONA.